Last month, both Amazon Wireless and Wirefly offered a promotion for a $40 credit with the purchase of a new 4G LTE phone on Verizon Wireless. Now, Amazon Wireless is offering a similar deal for anyone who purchases a phone on Verizon and activates a new Share Everything plan. 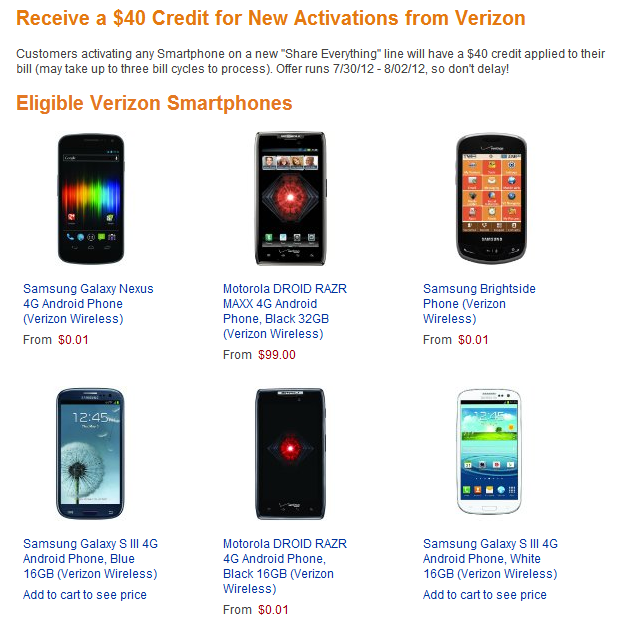 Basically, if you purchase select Verizon phones from Amazon Wireless between now and August 2nd, you'll get a $40 credit on your bill (which may "take up to three bill cycles to process"). If you were planning on pulling an upgrade anyway, you might as well go ahead and jump on this deal. Free money is, after all, free money. For a full list of applicable phones, head here.